Don’t forget a gift for your favorite pet this holiday season! 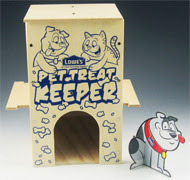 Lowe’s is offering a free Build and Grow Clinic for your child to make a simple Pet Treat Keeper. The free children’s workshop will be held on Saturday, December 19 at 10 a.m. at participating Lowe’s stores. Each workshop runs about an hour and is geared toward kids in first through fifth grade, although my four-year-old participates with no problems. Many of the projects are completed in much less than an hour. My son and husband have a great time at these workshops and it is fun to see how proud my son is of his projects!